"They're not anywhere. Their shoes, their clothes, they're all left behind. The people are gone!" Throughout the world, people have vanished into thin air for no apparent reason. On an airplane flight, husbands disappear from their seats in front of their wives, and children are nowhere to be found. Even stranger, their clothes remain behind. Where has everyone gone? The premise for Left Behind: The Movie is intriguing and suggests an interesting modern-day look at "The Rapture" described in The Book of Revelation. In other words, this story follows the pattern for the end of the world set up in the Bible. Based on the extremely popular series of books by Tim Lahaye and Jerry B. Jenkins, this film converts this story to the big screen in epic fashion. Unfortunately, the screenplay is basic and poor and lacks the depth to match the interesting premise. Instead, the actors are reduced to speaking clichéd lines that are almost painful to witness. I have not read the books, so it's difficult to compare the two versions, but I doubt they are as simple and poorly-executed as this film. Buck Williams (Kirk Cameron) is a famous CNN journalist who is trying to discover the reason for these disappearances. His investigation reveals a trail of corruption that leads to the upper echelons of government. This plot line just lacks interest and appears recycled from other, more interesting films. While it obviously follows the storyline of the books, there has to be more to this story than the events shown on screen. Cameron (Mike from Growing Pains) makes an unconvincing journalist and just can't pull off this starring role in the right fashion. Even less convincing is his real-life wife, Chelsea Noble, as a stewardess who somehow finds a job in the United Nations. Her character's scenes add virtually nothing to the plot, except for a briefly-examined relationship with pilot Rayford Steele (Brad Johnson). It's the pilot that provides the centerpiece to the story due to the changes to his personality, caused by "The Rapture". Johnson has a nice screen presence, and probably acts well in other films, but his role is tedious, save for one emotional moment. The only shining points in terms of acting are Walker: Texas Ranger's Clarence Gilyard Jr. and Janaya Stephens (The Skulls), who bring life and energy to fairly simple roles. 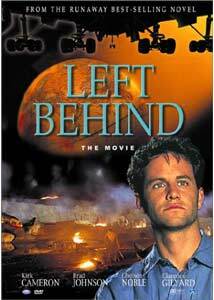 Left Behind: The Movie had a surprisingly large budget for a film funded and created by the Christian movie industry. It does contain a positive message about going to church and turning to God for spiritual guidance in life. This movie was actually released on video before its February theatrical release in order to generate excitement and word-of-mouth. In my opinion, the message is fine and understandable, but the execution of the story is poor. It's an uninteresting mix of cookie-cutter characters living in a simple world where plot complexities don't exist. Image Transfer Review: Left Behind: The Movie contains a full-frame transfer that is only slightly improved over the typical television transfer. While it's watchable and the black levels are relatively solid, there is nothing spectacular about the picture on this disc. The best scene visually is a nighttime air attack, and the colors are well done and interesting. However, they still aren't as impressive because of this lackluster transfer. Audio Transfer Review: The 2.0-channel Dolby Surround transfer is a basic track that possesses little power or depth. Even within the mayhem of crowds in frenzy, car bombs, gun shots, and more, this transfer remains relatively quiet and simple. It does have nice clarity in terms of dialogue and music, but the sounds lack the force of the better DVD audio tracks. It doesn't take away from the enjoyment of the film, but it also adds little to the overall presentation. Extras Review: This disc contains a decent selection of extra features that are informative but fail to add a high level of insight into the film. The main item of interest is The Making of Left Behind, a television special that provides a nice overview of the production and motives behind the movie. The documentary is very promotional and stresses the importance of the story and its spiritual message. While it becomes a little too much at times, the people behind this film appear genuine in trying to reach a mass audience with something important to them. The special is narrated by Janaya Stephens and covers elements ranging from the special effects, casting, and the recording artists involved with the soundtrack. Another helpful extra is the well-done cast and crew section, which includes fairly extensive biographies and filmographies for the major players in the production. The biographies vary from the usual type by describing their role in this film. This information is pretty basic and adds little to the understanding of the story. The Film Project section is a brief speech by Kirk Cameron explaining why the movie was released on video before the theaters. Also, he urges people to show up in droves in order to "send a wake-up call to Hollywood" about the audience for films with a spiritual message. Music videos for Midnight Cry by the All Star Choir and No Fear by Clay Crosse all exist on this disc in full-frame transfers. Cloud Ten also pushes their other films by including previews for Revelation, Tribulation, and Judgment. These films are contemporary religious stories with recognizable stars such as Gary Busey, Margot Kidder, Mr. T, and Nick Mancuso. Left Behind: The Movie presents a positive (although fairly simplified) message about the place of religion and spirituality in life. Through a modern-day version of the Book of Revelation, it pushes its ideas through a convoluted story that consistently strays from its focus. Due to this problem and a poorly written script, the story falls and loses its interest due to mostly uninteresting characters.